With 20 years of basement expertise, Total Basement Finishing is the only Chicagoland area basement contractor you can count on. Learn why homeowners prefer a basement remodeling expert over a general contractor. We specialize in basement finishing in Illinois. Our company is locally owned and backed with national support. 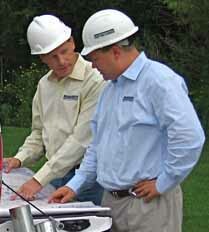 All TBF dealers are locally owned and operated by highly trained home improvement contractors. Each TBF dealer is given complete access to all of Total Basement Finishing's patented products, services and training, making TBF the right basement finishing investment for any homeowner. Contact our company today for an estimate at no cost or obligation from one of our licensed specialists. 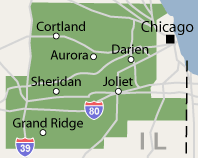 We serve the Joliet, Naperville, Aurora, Des Plaines, Elgin, Schaumburg, Arlington Heights, Bartlett, Palatine, Cicero, Kenilworth, Glencoe, Eola, Winnetka, Hoffman Estates, Barrington, Orland Park, Berwyn, Wheaton, Downers Grove, Boilingbrook, Oak Lawn, Oak Park, Lombard, Glenview, Saint Charles, Lockport, Elmhurst, Melrose Park, Plainfield, Carl Stream, Elmwood Park, Dekalb, Evanston, Northbrook, Tinley Park, Mount Prospect, Skokie and the surrounding Illinois area. The TBF basement wall system is a state-of-the-art unique basement finishing system. It's free-standing, rigid walls offer an insulation factor of R-13, a fire rating of class A, and are resistant to mold, water damage, stains and moisture. They also come in a variety of options. Everything you could want and need in a finished basement system? All Total Basement Finishing contractors are trained in the installation of Total Basement Finishing product by the manufacturer. 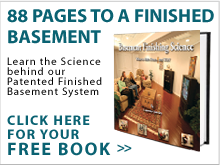 This ensures that each basement finishing system is installed properly and stands up to the limited lifetime warranty. When you schedule your free design consultation, we'll send out a System Designer who will work with you to design the perfect basement remodeling plan to suit your needs and style. The Total Basement Finishing dealer network of trained home improvement contractors offers the best system features, service and design. For a FREE estimate in Naperville, Aurora, Joliet, Des Plaines, Elgin, Schaumburg, Arlington Heights, Bartlett, Palatine, Cicero, Kenilworth, Glencoe, Eola, Winnetka, Hoffman Estates, Barrington, Wheaton, Berwyn, Orland Park, Skokie, Downers Grove, Tinley Park, Mount Prospect, Boilingbrook, Oak Lawn, Oak Park, Lombard, Glenview, Saint Charles, Lockport, Elmhurst, Melrose Park, Plainfield, Carl Stream, Elmwood Park, Dekalb, Evanston, Northbrook and surrounding areas, contact us today!